PHP library for two-factor (or multi-factor) authentication using TOTP and QR-codes. 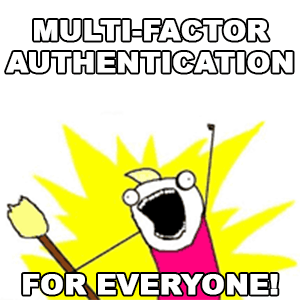 Inspired by, based on but most importantly an improvement on 'PHPGangsta/GoogleAuthenticator'. There's a .Net implementation of this library as well. cURL when using the provided ImageChartsQRCodeProvider (default), QRServerProvider or QRicketProvider but you can also provide your own QR-code provider. random_bytes(), MCrypt, OpenSSL or Hash depending on which built-in RNG you use (TwoFactorAuth will try to 'autodetect' and use the best available); however: feel free to provide your own (CS)RNG. If you want to hit the ground running then have a look at the demo. It's very simple and easy! These arguments are all 'write once'; the class will, for it's lifetime, use these values when generating / calculating codes. The number of digits, the period and algorithm are all set to values Google's Authticator app uses (and supports). You may specify 8 digits, a period of 45 seconds and the sha256 algorithm but the authenticator app (be it Google's implementation, Authy or any other app) may or may not support these values. Your mileage may vary; keep it on the safe side if you don't control which app your audience uses. The createSecret() method accepts two arguments: $bits (default: 80) and $requirecryptosecure (default: true). The former is the number of bits generated for the shared secret. Make sure this argument is a multiple of 8 and, again, keep in mind that not all combinations may be supported by all apps. Google authenticator seems happy with 80 and 160, the default is set to 80 because that's what most sites (that I know of) currently use; however a value of 160 or higher is recommended (see RFC 4226 - Algorithm Requirements). The latter is used to ensure that the secret is cryptographically secure; if you don't care very much for cryptographically secure secrets you can specify false and use a non-cryptographically secure RNG provider. ...or implement your own provider. To implement your own provider all you need to do is implement the IQRCodeProvider interface. You can use the built-in providers mentioned before to serve as an example or read the next chapter in this file. The built-in classes all use a 3rd (e.g. external) party (Image-charts, QRServer and QRicket) for the hard work of generating QR-codes (note: each of these services might at some point not be available or impose limitations to the number of codes generated per day, hour etc.). You could, however, easily use a project like PHP QR Code (or one of the many others) to generate your QR-codes without depending on external sources. Later on we'll demonstrate how to do this. The built-in providers all have some provider-specific 'tweaks' you can 'apply'. Some provide support for different colors, others may let you specify the desired image-format etc. What they all have in common is that they return a QR-code as binary blob which, in turn, will be turned into a data URI by the TwoFactorAuth class. This makes it easy for you to display the image without requiring extra 'roundtrips' from browser to server and vice versa. When outputting a QR-code you can choose a $label for the user (which, when entering a shared secret manually, will have to be chosen by the user). This label may be an empty string or null. Also a $size may be specified (in pixels, width == height) for which we use a default value of 200.
verifyCode() will return either true (the code was valid) or false (the code was invalid; no points for you!). You may need to store $secret in a $_SESSION or other persistent storage between requests. The verifyCode() accepts, aside from $secret and $code, three more arguments. The first being $discrepancy. Since TOTP codes are based on time("slices") it is very important that the server (but also client) have a correct date/time. But because the two may differ a bit we usually allow a certain amount of leeway. Because generated codes are valid for a specific period (remember the $period argument in the TwoFactorAuth's constructor?) we usually check the period directly before and the period directly after the current time when validating codes. So when the current time is 14:34:21, which results in a 'current timeslice' of 14:34:00 to 14:34:30 we also calculate/verify the codes for 14:33:30 to 14:34:00 and for 14:34:30 to 14:35:00. This gives us a 'window' of 14:33:30 to 14:35:00. The $discrepancy argument specifies how many periods (or: timeslices) we check in either direction of the current time. The default $discrepancy of 1 results in (max.) 3 period checks: -1, current and +1 period. A $discrepancy of 4 would result in a larger window (or: bigger time difference between client and server) of -4, -3, -2, -1, current, +1, +2, +3 and +4 periods. The second, $time, allows you to check a code for a specific point in time. This argument has no real practical use but can be handy for unittesting etc. The default value, null, means: use the current time. The third, $timeslice, is an out-argument; the value returned in $timeslice is the value of the timeslice that matched the code (if any). This value will be 0 when the code doesn't match and non-zero when the code matches. This value can be stored with the user and can be used to prevent replay-attacks. All you need to do is, on successful login, make sure $timeslice is greater than the previously stored timeslice. Step 3: Store $secret with user and we're done! Ok, so now the code has been verified and found to be correct. Now we can store the $secret with our user in our database (or elsewhere) and whenever the user begins a new session we ask for a code generated by the authentication app of their choice. All we need to do is call verifyCode() again with the shared secret and the entered code and we know if the user is legit or not. As mentioned before, this library comes with three 'built-in' QR-code providers. This chapter will touch the subject a bit but most of it should be self-explanatory. The TwoFactorAuth-class accepts a $qrcodeprovider argument which lets you specify a built-in or custom QR-code provider. All three built-in providers do a simple HTTP request to retrieve an image using cURL and implement the IQRCodeProvider interface which is all you need to implement to write your own QR-code provider. The default provider is the ImageChartsQRCodeProvider which uses the image-charts.com replacement for Google Image Charts to render QR-codes. Then we have the QRServerProvider which uses the goqr.me API and finally we have the QRicketProvider which uses the QRickit API. All three inherit from a common (abstract) baseclass named BaseHTTPQRCodeProvider because all three share the same functionality: retrieve an image from a 3rd party over HTTP. All three classes have constructors that allow you to tweak some settings and most, if not all, arguments should speak for themselves. If you're not sure which values are supported, click the links in this paragraph for documentation on the API's that are utilized by these classes. All you need to do is return the QR-code as binary image data and you're done. All parts of the $qrtext have been escaped for you (but note: you may need to escape the entire $qrtext just once more when passing the data to another server as GET-argument). Voilà. Couldn't make it any simpler. This library also comes with three 'built-in' RNG providers (Random Number Generator). The RNG provider generates a number of random bytes and returns these bytes as a string. These values are then used to create the secret. By default (no RNG provider specified) TwoFactorAuth will try to determine the best available RNG provider to use. It will, by default, try to use the CSRNGProvider for PHP7+ or the MCryptRNGProvider; if this is not available/supported for any reason it will try to use the OpenSSLRNGProvider and if that is also not available/supported it will try to use the final RNG provider: HashRNGProvider. Each of these providers use their own method of generating a random sequence of bytes. The first three (CSRNGProvider, OpenSSLRNGProvider and MCryptRNGProvider) return a cryptographically secure sequence of random bytes whereas the HashRNGProvider returns a non-cryptographically secure sequence. You can easily implement your own RNGProvider by simply implementing the IRNGProvider interface. Each of the 'built-in' RNG providers have some constructor arguments that allow you to 'tweak' some of the settings to use when creating the random bytes such as which source to use (MCryptRNGProvider) or which hashing algorithm (HashRNGProvider). I encourage you to have a look at some of the 'built-in' RNG providers for details and the IRNGProvider interface. Another set of providers in this library are the Time Providers; this library provides three 'built-in' ones. The default Time Provider used is the LocalMachineTimeProvider; this provider simply returns the output of Time() and is highly recommended as default provider. The HttpTimeProvider executes a HEAD request against a given webserver (default: google.com) and tries to extract the Date:-HTTP header and returns it's date. Other url's/domains can be used by specifying the url in the constructor. The final Time Provider is the NTPTimeProvider which does an NTP request to a specified NTP server. You can easily implement your own TimeProvider by simply implementing the ITimeProvider interface. As to why these Time Providers are implemented: it allows the TwoFactorAuth library to ensure the hosts time is correct (or rather: within a margin). You can use the ensureCorrectTime() method to ensure the hosts time is correct. By default this method will compare the hosts time (returned by calling time() on the LocalMachineTimeProvider) to Google's and convert-unix-time.com's current time. You can pass an array of ITimeProviders and specify the leniency (second argument) allowed (default: 5 seconds). The method will throw when the TwoFactorAuth's timeprovider (which can be any ITimeProvider, see constructor) differs more than the given amount of seconds from any of the given ITimeProviders. We advise to call this method sparingly when relying on 3rd parties (which both the HttpTimeProvider and NTPTimeProvider do) or, if you need to ensure time is correct on a (very) regular basis to implement an ITimeProvider that is more efficient than the 'built-in' ones (like use a GPS signal). The ensureCorrectTime() method is mostly to be used to make sure the server is configured correctly. Licensed under MIT license. See LICENSE for details.